Finally, a place to organize all those guinea pig related links! 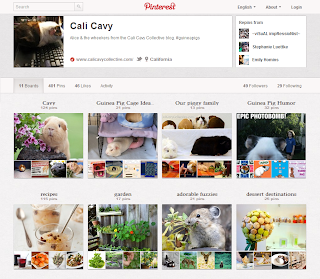 I've been using Pinterest to keep track of cute piggy products, interesting cage ideas, beautiful cavy portraits, adorable cartoons, and favorite guinea pig memes - among other things. Feel free to check out the Cali Cavy Pinterest boards. Looking forward to seeing your peegs! I don't think I've heard of a pika before but after seeing the pictures on your board, I agree; I'd love to snuggle one and give it a home!